This quanket was donated in September to the County of Ventura, Children & Family Services, and will go to a foster child. It will also be included in this year’s 100 Quilts for Kids program, which runs through the end of September. This hourglass block pattern quanket is a riot of such fun colors and patterns! Each summer, I host a family get together at our home, and this year’s theme was Country Fair. The menu included homemade lemonade, fresh salads, peach and apple pies, and so much more yummy food! In addition to folks bringing their favorite ‘Country Fair’ dish, I also asked everyone to bring a scrap of fabric that I would make into a “family quilt”. With no guidelines other than for the fabric to be a cotton or cotton-blend, and bigger than 12″x12″, as you can see, I got quite a diversity of colors and fabrics. Some brought fat quarters, while one sister brought an old, favorite sundress, another a vintage apron she had gotten from Granny, and my daughter contributed one of my grandson’s onesies. I chose the hourglass block pattern for two reasons: first, it lends itself to using a lot of different colors and patterns; and second, I felt it aptly gave a nod to the concept of time – the passing of time, and how precious time spent with family is! The other thing I liked about the hourglass block is that it allowed me to have everyone’s contributed fabric touch each others, symbolic of how we each touch one another’s lives. I believe this quilt qualifies for my ‘most pieces’ pieced quilt, coming in at just over 800 pieces pieced! Before this one, my What’s a Zig without a Zag quilt was my ‘most pieces’ quilt at 504 total pieces. While it was quite a bit of work to design and piece this one, it was very rewarding to see it come together. I used this quilt to describe how I make quankets, hoping that it inspires others to make and donate quankets to foster kids. 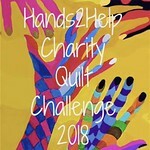 Quankets are a great project for those that love the piecing aspect of quilting, but perhaps don’t have the tools, training or patience to finish in the traditional quilting method. This quilt incorporates some new and some past project scraps. The hourglass blocks incorporated some scrap fabric from Edith, and from a quilt I made years ago for my nephew. Some of the muslin was leftover from the fitting pattern for the wedding dress I made for my daughter nine years ago. This was donated in September to the County of Ventura, Children & Family Services, and will go to a foster child. It will also be included in this year’s 100 Quilts for Kids program.